A new biomass-fueled power plant in South Carolina—replacing a coal-fired plant—is a winner on a number of counts. It's guaranteed to deliver big cost savings to the U.S. government, reduce greenhouse gas emissions, and improve local air quality. When homeowners want to better manage their power bills, they often sign up for a payment plan so that they pay the same amount every month. The U.S. government has done something similar at its Department of Energy (DOE) Savannah River site in South Carolina—but it stands to actually save about $944 million over 19 years by taking this approach. The savings will actually occur as a result of re-investing the lion's share of the $944 million into a mas-sive wood biomass-fueled cogeneration plant at the Savannah River site to replace a coal-fired power plant. When considering the $795 million the government will pay on its budget plan in energy costs over 19 years and the savings of $944 million it has been guaranteed by the project developer, the net benefit to the federal government is about $150 million in cash plus a new power plant, at no extra cost to taxpayers. 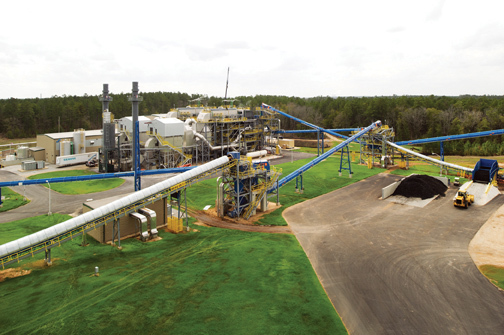 The U.S. government recently commissioned the 20-megawatt DOE Savannah River Site Biomass Cogeneration Facility, built using the performance contract approach. The biomass facility is providing both power and steam for heat and industrial processes to the Department of Energy. In 2009, the government awarded a performance contract to Ameresco Inc. to develop, finance, and build the renewable energy project on 34 acres at the Savannah River site. As part of its commitment under the government's Energy Savings Performance Contract (ESPC) program, Ameresco has guaranteed $944 million in savings over the 19 years it will operate the plant. "This is the largest savings guarantee, ever, under an energy savings performance contract," says Keith Derrington, executive vice-president and general manager of federal operations at Ameresco. "And it is also the largest renewable energy project ever done under a performance contract." As part of its commitment, the government has agreed to pay Ameresco a set amount per month, up to a total of $795 million over 19 years, just like someone on a payment plan, and it owns the facility. Ameresco makes money based on how efficiently it runs the facility. If the cost to operate the biomass cogeneration facility each month is less than what Ameresco is paid by the federal government, the difference is the company's profit. Since 1996, the federal government has initiated numerous energy efficiency projects on federal buildings through its ESPC program. Derrington says that this program is having a significant impact on total energy consumption in the United States, as the federal government is the largest consumer of energy in the country, at about five percent of the total. The fuel for the co-generation system is wood waste such as stumps, tree limbs, tree tops, and bark that was typically left behind by forest companies. 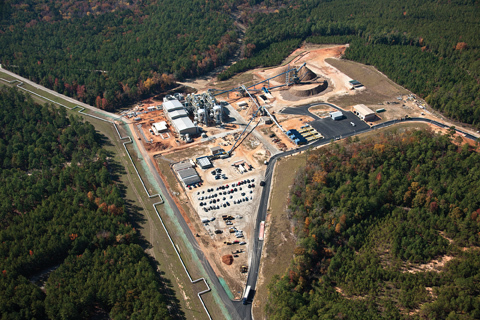 The waste is processed into 2" material, and four fuel contractors transport it by truck to the Savannah River site. "This project exemplifies how renewable power can meet the electrical demands of the nation's largest federal facilities, while reducing energy and water costs through energy efficient technology," says Derrington. "Most importantly, this project has been implemented through private-sector investment at no direct cost to taxpayers and demonstrates how private sector solutions can meet public sector needs." The Savannah River biomass power plant will provide about 30 percent of the total power needs on the 310 square mile site. The federal government initially developed the site during World War II to support the war effort, which included manufacturing nuclear components. That has since ceased, and it is now focused on environmental management, primarily the stabilization and safe storage of nuclear waste. Some of the power produced by the biomass facility will be used in this stabilization process. In addition to saving the U.S. government money on its power bill, the project will also pay significant dividends in local jobs, improved air quality, reduced greenhouse gas emissions like carbon dioxide, and the use of wood waste material (often left to rot in the forest) as fuel. The Ameresco project consists of three biomass-fueled power plants, one larger plant and two smaller plants, that operate only during the five-month winter heating season, strategically located on the 310 square mile site to efficiently supply power and steam to various facilities. The plants are within four miles of each other but are all controlled from a central facility. "The large coal-fired plant it replaces supplied three distinct areas of the Savannah River site. We determined that the loads were so small in two of the locations that it made more sense to have three plants," says Derrington. "There was a heating-only load at two sites that was seasonally based." Installing a smaller boiler at each of these two locations allowed Ameresco to eliminate about four miles of 22" diameter steam line. Taking this step of establishing three sites saved about a half-million dollars per year in energy costs. The biomass-fueled co-generation system replaces a 50-year-old, coal-fired power plant equipped with oil-fueled boilers, which according to Derrington was in need of repair and was the single largest emitter of particulate into the atmosphere in South Carolina. The new biomass power system has reduced particulate emissions by 400 tons per year and is designed to reduce carbon dioxide emissions annually by 100,000 tons. Because of improvements in design efficiency, the power plants will also reduce their use of water by 1.4 billion gallons per year. The fuel for the co-generation system is wood waste such as stumps, tree limbs, tree tops, and bark that was typically left behind by forest companies. The waste is processed into about 2" material, and four fuel contractors transport it by truck to the Savannah River site. This part of the process has created 125 jobs—in an area with about 24 percent unemployment—to process and deliver the 325,000 tons of biomass that the system will consume annually. 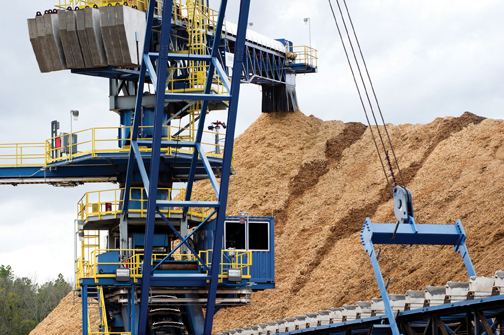 To maintain a steady flow of fuel, Ameresco has a 30-day fuel supply stored at the Savannah River site, and it also has the capability to chip whole logs, if needed. South Carolina generates about 20 million tons of forest waste annually. Material for the power plant is being gathered from within a 100-mile radius around the site. The plant operation is creating a further 25 full-time jobs, and during its 30-month construction period, the project created an estimated 800 jobs in the mechanical, construction, engineering, and supply sectors. "The project is providing a very big economic boost to the area," says Derrington. River project was challenging for Farmington, Massachusetts-based Ameresco. Founded in 2000, the company describes itself as a leading independent provider of comprehensive services, energy, efficiency, infrastructure upgrades, and renewable energy solutions for facilities throughout North America. "This is the largest biomass facility we have done," says Derrington. "The next largest one we had done previously was probably in the range of 10 to 12 megawatts." He adds that the company has considerable experience in biomass and biogas-related co-generation projects. The new biomass power system at Savannah River has reduced particulate emissions by 400 tons per year and is designed to reduce carbon dioxide emissions annually by 100,000 tons. Because of improvements in design efficiency, the power plants will also reduce their use of water by 1.4 billion gallons per year. Derrington was involved in his first biomass project 30 years ago. "I think Ameresco is fairly unique among companies working in the performance energy contracting market, particularly in the federal market, to have that experience," Derrington says. "In the last two years, we have constructed probably four biomass projects for different federal facilities with the Savannah River project by far being the largest." Ameresco personnel have been involved in projects initiated under the federal government's ESPC program since it was launched. Discussions began between the Department of Energy and Ameresco in 2007 to determine the Savannah River site's power requirements and matching that with the available biomass fuel supply that could economically be delivered to the site from the surrounding area. That led to full blown design and permitting for the project. Derrington says that financing the project took a bit longer because of the state of the economy when the contract was awarded in 2009. Then there were the challenges of the construction project itself. "When we began site work on the project, we had 40 inches of rain," says Derrington. "It was unheard of. We had a number of tropical hurricane storms that came through, and in one day, we had over 20 inches of rain on the site. Amazingly enough, we were able to work through that without any loss of time on the schedule, and we ended up completing the project four months ahead of schedule." Casey Industrial was the main contractor for the project. Bruks provided three truck dumps and all the fuel handling equipment. 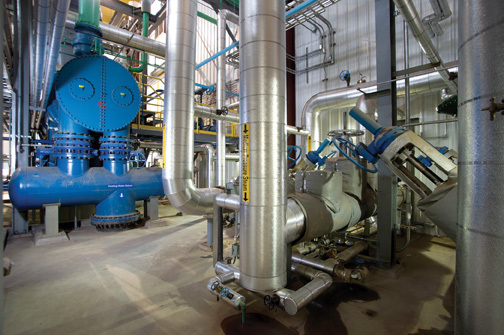 The project's two circulating fluidized bed boilers were manufactured by Energy Products of Idaho (EPI). In terms of similar potential projects, Derrington says that the availability of economical biomass in the southeastern U.S. makes that area particularly favorable for more power or cogeneration projects similar to the one built at the Savannah River site. Ameresco is investigating other potential projects in the area. There may even be other opportunities with federal government buildings. The new biomass power system has reduced particulate emissions by 400 tons per year and is designed to reduce carbon dioxide emissions annually by 100,000 tons. Because of improvements in design efficiency, the power plants will also reduce their use of water by 1.4 billion gallons per year.